Back in the late 1800′s, when lumber was the prime commodity in a small town known as Leonard, Schuberg’s Bar was born. Originally the building was leased to the county as a temporary jail. Six months later the jail was out and a bar was installed. Serving the locals and the many lumberjacks of the time, the town grew and changed its name to Big Rapids and the Bar thrived. When prohibition became the law of the land, the original bar was removed and replaced with pool tables to create a pool hall and card room. Local rumor has it that although no longer a “bar”, beer was still readily available during those years. After the repeal of prohibition, Carl Schuberg installed a new bar – the same one that is there today – some tables and chairs and opened the doors as Schuberg’s Bar. The depression hit and the Bar became a local trading post. A large chalk board hung on the wall where patrons could post items for sale. Livestock, crops, land, furniture and anything else that one had for sale were traded during those years. One of the oldest business in the Big Rapids area, Schuberg’s Bar has survived wars, depressions, good times and bad. 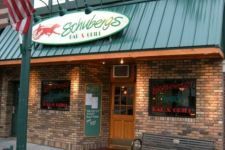 Today Schuberg’s Bar is known for good food, good times, and a friendly and relaxed atmosphere, It’s a place for visitors to Big Rapids to meet up with family, friends and old college mates as well as being popular with the locals and college students. Although many things have changed, the Bar still looks and feels much as it did in the beginning with the original locally made furniture and pine covered walls. Schuberg’s Bar is more than a business, it’s a local tradition. The current “caretakers” Jeff and Vicki Rumsey, have been there over 35 years and invite you to visit and enjoy a “Schuburger”, a cold drink, and a slice of history.